With what appears a seize in the jamboree of kidnappings that have swept and ravaged the light of the nation, Anambra State, new and explosive information recently made available to correspondents of Ukpakareports.com reveal a jolting ordeal that had been kept under wraps by the office of the Inspector General of Nigeria and his team of police officers for months while named culprits continue their practice emboldened and undeterred. 1. Chukwudi Nnabue [aka Akpulionyenwe-olu] hails Umuokpu village in Awka. He is a member of a certain G20 club in Anambra and was released from police custody through the instrumentality of Chris Uba [Eselu Uga]. Chukwudi Nnabue masterminded the kidnapping of one wealthy Awka indigene [based overseas] who was home on a short visit. Chukwudi Nnabue's gang consist of eleven  young men – of which he uses his security outfit by the name – Liberty Security Company – as cover to obtain and supply arms. All the guns used in his security company are the same ones used in his kidnap operations. 2. Uche Ugwu [aka Otika] is a native of Nsukka in Enugu State but lives at Iselle-Ukwu in Delta State. He was the hit man of HRH Igwe Kenneth Okonkwo of Amansea – who employed him together with three others to kill one Eze No Oba, of Ofemili – on the day of a supposed peace meeting. They were paid six  million naira for the job, which they shared N1.5million a piece. Also, he led the gang in January 2009 to kidnap one Aboo [aka Nwatakwochaka of Amansea]. Aboo paid a ransom of five  million to secure his release in addition to some unspecified amount of money taken from him via his ATM card. Uche Ugwu in the company of three other young men robbed the home of Chief Okpuno last year. They robbed the owner of a filling station at Amansea junction. Another of his operation involved the kidnapping of Isienyi of Ebenebe [this year] by a gang led by the first son of Isienyi. A ranson of N3million was paid. Another operation netted Chumah Ugwu N2.5million for the brutal murder of Chinweike Okoye, a native of Ugwuoba, Enugu State. He used his share of the money to buy a Mercedes Benz 190 V-booth car. 3. Uzonna [aka Better Life], from Obosi in Idemili LGA of Anambra State. He lives in Asaba while his pregnant wife stays in Obosi where all the arms used in kidnapping operation by her husband and his gangs are kept in the custody of his wife. The wife would release the weapons to his boys on demand. The gang is made up of seven  young men. One of the members by the name Chibuzor Ogbogu is currently being detained at the Awkuzu SARS office. Better Life and his gang were responsible for the kidnapping of Igwe Alor. 4. Chinedu Olie [aka Chinedu Onyeogonogo] a native of Onitsha who lives in Asaba was responsible for the cold-blooded murder of an Hausa Trader at Upper Iweka, Onitsha. Chinedu Olie paid his driver [Chinedu Ocho of Aba Ngwa in Abia State] who lives at No. 26 Uke Street, Omagba Phase 1 in Onitsha, in US Dollars at a plaza near ABS-TV Onitsha to execute one of the unsolved kidnappings in Anambra. Chumah Ocho is now cooling his heels in SARS cell at Awkuzu in Anambra. 5. Chibuzo Omaliko, from Abatete in Anambra - who is also under detention at the SARS detention center in Awkuzu for the past one year has a gang that still roam the streets of Anambra. They are armed and dangerous. 6. Okechukwu Onyebuchi [aka Offender] and Ifeanyi Onukwuili – both hail from Abakaliki in Ebonyi State but claim Onitsha citizenry. 7. Kene – hails from Aguleri in Anambra West LGA of Anambra State and has been in detention at SAR, Awkuzu for over six months. He is known to keep arms for all the criminal groups operating in the Umuleri/Aguleri axis. An impressive amount od arms and ammunitions were recently recovered from him. 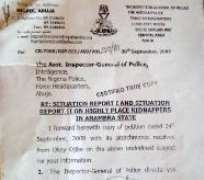 Ukpakareports.com reached out to the police in Awka regarding the personalities and no response was given. It is the hope of concerned citizens that as the Christmas season rolls by that the Nigeria Police Force may have taken the bull by the horns.